After a very productive week of fishing with the last group of guests topping their boxes up nicely, we celebrated Canada Day with a keen group of new guests, mostly veterans of previous QCL fishing adventures. Tons of bait scattered throughout the fishing grounds is providing pretty steady action at any of a number of favourite fishing spots. 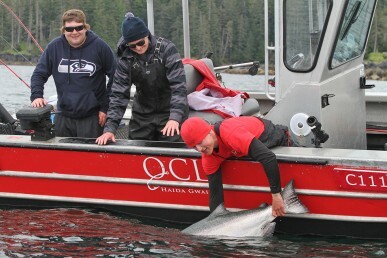 Cape Edenshaw remains quite productive with teen-sized feeder Springs and the odd Tyee lurking in the weeds. While Cape Naden continues to produce more than its share of salmon action it’s the north shore that’s been coming to life lately. The humpbacks have moved a little offshore and out of the calm backwaters they’ve been busy in these past weeks. That’s a sure sign that there’s more baitfish moving through the deeper water and savvy anglers have trolled on out there to join them. The reward… a whole new mass of brilliant silver salmon – a mixture of Chinook and Coho – pursuing shoals of needlefish and immature herring. Anchovies fished over dummy flashers are most successful. Last summer the guides denoted “east bay Parker” as a new favourite fishing hole which was a steady producer all summer long. Strangely it’s been slow to come to life so far this season. 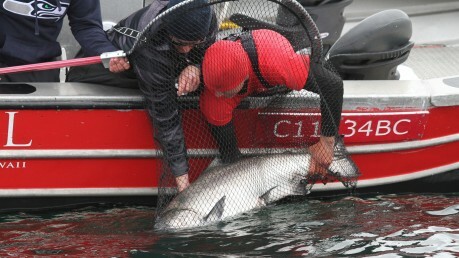 That may have changed over the weekend as our 3rd 50-pounder-plus fish was recorded on Friday. Wondering if he’s onto something, veteran QCL guide Jackson Jane worked his magic at east bay Parker and teased out his second giant of the summer! 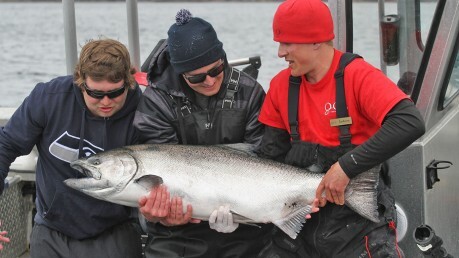 Returning lodge guest Jared D set the hook and played a stunning big Chinook to the boat with Jackson and fishing partner Ryan cheering him on. A quick measurement scored the beauty at 52 pounds before they carefully returned the fish to the water and Jackson coaxed it back to vigorously swim away. Congratulations Jared! Well done guys! It’s really nice to see these very special Tyees revived and released in such good shape!